Republished from Eco-Business: Original article here. The decision to award S$980,000 in funding to develop the world’s first biodegradable, bioplastic straw during the finale of The Liveability Challenge stirred controversy. Does this reflect a difference of opinion, or naivete about single-use plastics? Mr Zhaotan Xiao from RWDC Industries pitching biodegradable bioplastic straws at The Liveability Challenge Finale. His solution was awarded S$980,000 in funding. Image: Eco-Business. The first-ever Liveability Challenge concluded on Wednesday with Singapore firm RWDC Industries emerging as the winner with its proposal to produce drinking straws made from a certified biodegradable biopolymer that can replace single-use plastic straws. The company was awarded S$980,000 by Temasek Foundation Ecosperity for winning the Challenge, which sparked fierce debate within Singapore’s sustainability community about plastic use. 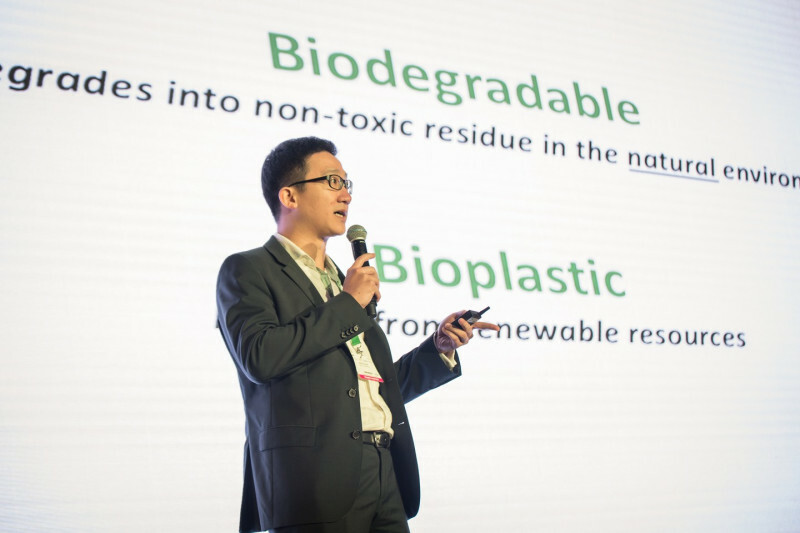 Zhaotan Xiao, president of RWDC, pitched the idea of creating straws that would decompose under regular natural conditions into water and carbon dioxide before a panel of judges and a 250-strong audience of investors and sustainability professionals at Marina Bay Sands. The technology behind it—manufacturing a biodegradable material called polyhydroxyalkanoates (PHA) from edible oils and even waste cooking oil—has been certified by credible third-party institutions, said Xiao. Speaking to Eco-Business after the event, Xiao said the decision to focus on straws was based on the scale of straw use and pollution being one critical factor. Singapore uses an average of 2.2 million straws every day, “a stark example of extreme waste being generated for minimal use” that ends up in oceans harming marine life, said Xiao. “We believe that our straws will [also] be the start of a long but essential process of educating consumers about the true ecological footprint and hazards of their buying choices, especially products falsely labelled as biodegradable,” he commented, pointing out that biodegradable straws on the market today are compostable, and not truly biodegradeable. This means they decompose only under specific conditions, and are otherwise as polluting as their plastic counterparts. Calling the impact of the winning solution ”far-reaching”, Temasek Foundation Ecosperity chief executive Lim Hock Chuan, who was also one of the five judges, said the development could eventually lend itself to other applications, such as cups, food boxes and containers used by fast food restaurants. “Through The Liveability Challenge, we hope that consumers will begin to choose product packaging and containers made of biodegradable plastics over those that are not biodegradable,” he added. That is RWDC’s eventual aim, according to Xiao. The company, which produces a water-based PHA emulsion to replace the plastic lining in disposable food packaging, will look to expand the technology behind the straws to other items in the long-term. But for now, the team is working to come up with a prototype within three months with the funding obtained. “This prototype will be subject to various tests, including tests on the consistency of performance and biodegradability,” said Xiao. Explaining the unanimous choice by the panel to award funding to RWDC, judge and group chief executive of Sindicatum Sustainable Resources, Assaad Razzouk, said the amount of research behind the pitch and potential applications of the technology were major factors. “The other solutions we saw were either too ambitious or not ambitious enough, or there was not enough research and time put into the proposal,” he remarked. The team scored highly on the three criteria for evaluation: impact, feasibility and commercial viability. “The cost proposition was very competitive, and it’s an impressive solution to deal with the scourge of ocean plastic, so it merited the win,” said Razzouk. “We believe there is a lot of greenwashing and other misinformation about the environmental impact from these alternative straws. Most of these straws are branded as ‘biodegradable’, when in reality they are only compostable, that is, they degrade only under certain conditions of temperature and humidity,” commented Zhaotan Xiao, President, RWDC Industries. RWDC’s was one of six solutions among which included a reverse vending machine that exchanges plastic bottles for public transport credits, a radiant cooling solution for vertical farms and awnings, and compostable single-use foodware. The Liveability Challenge, presented by Temasek Foundation Ecosperity and organised by Eco-Business, is a global search for solutions to urban challenges in tropical cities. In its first edition this year, organisers had called for submissions to address sustainable cooling and waste management and selected the six finalists from more than 200 entries around the world. Besides the pitches by six teams, including one from Malaysia and another from Australia, there was also a fireside chat featuring En Lee, partner and head of Asia Pacific at impact investment firm LGT Impact, and moderated by Daniel Lin, executive director of crowdfunding investment platform FundedHere. News of the Challenge’s winner has sparked a lively debate on social media, with some responding in support to the idea while others expressing outright surprise. Some questioned the need to devote such a large amount of funding to a product that is, for the most part, unnecessary; while others wondered at the need to find a new type of biodegradable material. Some others pointed to a growing movement to go straw-less, citing a recent poll which found that 84 per cent of consumers said they were happy to go without straws, while 81 per cent said they would be willing to use more environmentally friendly substitutes. From a technological point of view, Xiao said many of the purportedly green options on the market are seldom as environmentally friendly as they appear. “We believe there is a lot of greenwashing and other misinformation about the environmental impact from these alternative straws. Most of these straws are branded as ‘biodegradable’, when in reality they are only compostable, that is, they degrade only under certain conditions of temperature and humidity,” he told Eco-Business in an interview. Meanwhile, responding to comments online, Eco-Business managing editor Jessica Cheam said in a post that RWDC’s solution is not a “magic bullet” to the environmental crises in the world. Globally, writers and experts have also pointed that it may be impossible to eliminate straws completely, and there is a need to be inclusive even as global food and beverage chains such as KFC and Starbucks choose to phase these out. People with physical disabilities sometimes require the help of straws to drink, while to others with conditions such as Parkinson’s disease, bamboo or metal straws can be dangerous, in spite of their own personal commitment to protecting the environment. On RWDC’s part, Xiao says that his company’s biodegradable straws are a “stop-gap solution”. “We would be more than happy if the world gave up straws, as it frees up our PHA for other uses,” he said. Temasek Foundation Ecosperity’s Lim added: “We are excited by all the conversations surrounding the inaugural Challenge, as well as all the promising ideas and enterprise shown by the proposals that we received.